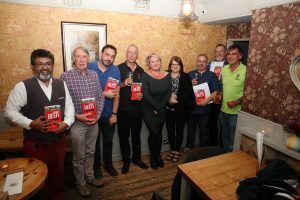 The opportunity to discuss beer and brewing with brewers or cider and perry making with cidermakers has benefited visitors to recent CAMRA events held in Newbury. 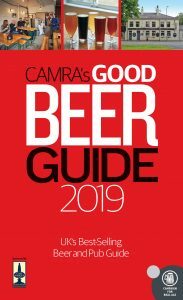 Local brewers Kevin Brady (Indigenous) and Richard Marshall (Hermitage) were at the King Charles Tavern for the launch of CAMRA’s 2019 Good Beer Guide (GBG) on 25 September. In the main bar, applause greeted the publicans as Andy introduced them and presented their GBG documentation. Afterwards, Joshua Khan led a group to the smaller front bar to pose for a photo, holding the Guide.